Come on, you have to have fun with photography. I could be that serious, "This is ART, damn it!" type or be the photographer who posts a caption on all of your photos where I *swoon* at every facet of it (please, can we retire that word, along with statements like "I'm absolutely IN LOVE with this bride's veil!" when you can't be "in love" with every little thing, it starts lacking sincerity). 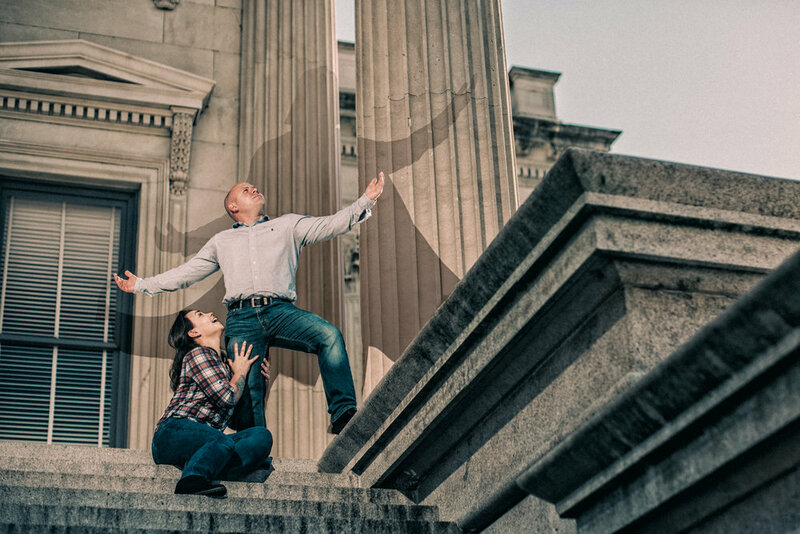 But while I have my vision, sometimes my clients have theirs and so at the end of the engagement session with Kait and Fonzie, he asked if I would do something "that's his thing," that is, a sort of "King of the World" shot. I had previously seen the Customs building in Charleston and suggested me go there. Alas, the steps were covered in Chinese paper parasols as an awareness campaign for a local hospice, but I found a corner and made the shot above. But, did you know that this couple is getting married next year on May 4, 2018? May the Fourth? MAY THE FOURTH BE WITH YOU?! Kait asked for a special edit to this picture. I was happy to oblige. Whether it is a special request or even that candid "between-the-shots" capture, take my advice: HAVE FUN, people!